You can find Baile Govora, one of the oldest balneological and climatic resorts in Romania at an altitude of 360 metres and surrounded by thick forest. 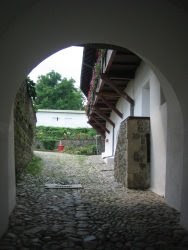 At the beginning of the twentieth century, Govora was famous for its luxurious hotels, medical treatments and huge potential of entertaining tourists. The fame goes on today, as the spa is know as a resting and treatment location for most visitors. Baile Govora is situated in the southern part of Romania, in the Subcarpathian Depression with the same name and only 20 kilometers away from Ramnicu Valcea. The name of this spa is related to that of the Monastery of Govora, from Govora Sat. Among the great figures that played an important part in making Govora what it is now, I.C. Bratianu and doctor Popescu Zorileanu are worth mentioning. 120 years ago, the two founded the resort, as a medical facility for treating respiratory problems and other related illnesses. Baile Govora is open to the public throughout the year and it's famous for its iodinated mineral and sulphurous water, used for external treatment and magnesium, calcium and sulphurous-rich water, used for internal treatment. These treatments are in use since 1866 and this spa is very important to those that suffer from respiratory diseases like bronchial asthma, chronic bronchitis, lung emphysema, microbial or viral pneumopathies, rhinitis, sinusitis, pharyngitis etc. Also, they have been known to cure degenerative diseases (spondylosis, arthrosis, polyarthrosis) and abarticular rheumatic diseases (tendinitis, tendomyositis, scapulohumeral periarthritis). Tourists can take advantage of mineral water baths and mud baths (the mud is brought from Ocnele Mari), electrotherapy, kinetotherapy, honey-based cures etc. In Govora you can also find a children's sanatorium for rheumatic and respiratory diseases. Aside from treatments, the visitors of Govora can also play tennis and enjoy a stroll in the midst of Mother Nature. One of the place's landmarks is surely the Govora abbey founded at the beginning of the fifteenth century and rebuilt by the rulers Vlad Calugarul and Radu cel Mare at the end of the same century. Constantin Brancoveanu also had an influence on the look of the monastery, as he financed the wall paintings between 1710 - 1711. This place is also a historical and cultural landmark, as in 1640, the great ruler Matei Basarab, installed here a printing press, that created the book Pravila de la Govora, the oldest collection of printed laws in Romanian. If you plan on going sightseeing, you might want to stop and check out the "Gheorghe Petre" archeology and art collection, the ruins of the Roman castra of Pons Vetus from Caineni, or the Anton Pann memorial house, plus the famous Polovragi and Muierii caves. "Cocosul de Hurez" - a craftsmen fair organized every year in the first Sunday of June; it includes the "Vicsoreanu Memorial"
"Cantecele Oltului" - a popular musical festival, organized annually in the first week of August in Calimanesti and Ramnicu Valcea. This festival also integrates the popular arts fare "Lada de Zestre".